Working in a garden requires a lot of tasks and having the right tools makes it easier. Since there are a lot of tools available, you might be confused which ones are essential. These tools will help you keep your garden looking its best. A part of garden maintenance involves cutting and trimming small trees, shrubs and other perennials. Hand pruners and loppers are essential for these tasks. Pruners can be used for cutting stems and branches with a small diameter. Loppers are intended for larger branches. 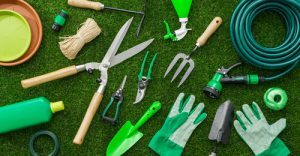 These tools can be used for deadheading or regular trimming activities and pruning shrubs regularly initiates healthy plant growth. Cutting tools are also essential during harvesting season if you grow fruit trees and vegetables in your garden. Grass can grow fast and every gardener needs a lawnmower. Go with an affordable model that can be easily stored in the space you have available. Water is essential in a garden and a good garden hose will make watering plants and vegetables easier. A water sprinkler or sprinkler head that can be attached to the garden hose is handy to have when you are working in planters, plant boxes and flower pots with delicate herbs and flowers. Having a wheelbarrow or garden cart makes moving and lifting objects like garden soil, fertilizers and pots much easier. Investing a wheelbarrow will help you accomplish these tasks and reduce the chance of an aching back. Shovels and spades are needed for digging soil, edging and even moving mud and large debris in the garden, so invest in a good one with high-quality material. The handle should be comfortable and there should be ample length to help provide good leverage. Another garden essential is a hand trowel that can be used for various purposes such as transplanting seedlings in pots or trays, distributing soil in pots and getting fertilizer in sacks. Having a well-made trowel will make your garden maintenance a stroll in the park. Previous Previous post: Garden & Greenhouse Cover Story – Organocide® by Organic Laboratories, Inc.